Michael New made a similar point at the Houston NASA Technosignatures workshop: NASA has funded some SETI work since 1993 (including that workshop itself). The footnote in the text above mentions 3 grants explicitly, but I think they missed one. Working with Jill Tarter and others I’ve tried to count every NASA and NSF grant for SETI work since 1993. I don’t know of any from the ’90’s, but, as the report states, there are some in the past 15 years. “Detection of Complex Electromagnetic Markers of Technology,” 3 years (+ 1 year no-cost extension), $660,079 (PI: Jill Tarter NRA-OSS-01-ASTID). Money funded studies by Cullers, Stauduhar, Harp, Messerschmitt, and Morrison on using autocorrelation and other methods for detecting broadband SETI signals. “Instrumentation for the Search for Extraterrestrial Intelligence,” 3 years, $590,589 (PI: Werthheimer, ASTID 2011 NNH11ZDA001N-ASTID) Money funded building an instrument at Arecibo/GBT. Wow! $4.7 million! That’s a lot, right? Well, not really. That means that since 1993, the entirety of federal grant spending on the topic is about $180,000/yr, which, after indirect costs, supports 1-ish FTE (i.e. one scientist/engineer). So one person at a time. Now maybe that’s not fair, and we should count from 2001, when the first of these grants began. Then it’s $262,000/yr, so we’re up to maybe 1.5 FTEs. NASA sets its priorities by following the recommendations of the National Academies of Science, Engineering, and Medicine while simultaneously implementing national priorities established by the President and Congress. SMD will continue to evaluate technosignatures research in the context of the Directorate’s overall portfolio through its standard scientific prioritization process. This is mealy-mouthed, but the bottom line is that SETI funding is not a high priority in the NASA authorization bills or in the 2000 or 2010 Decadal reviews, so NASA doesn’t feel that it needs to fund it. Now, this isn’t really a great excuse—the Decadal reviews do say that SETI is good and worth pursuing (even if they don’t recommend funding), and there’s nothing preventing NASA from including SETI under the astrobiology umbrella (which is a field it’s required to pursue). Indeed, NASA is very inconsistent about whether SETI is allowed to be funded via grants—contrast its protest above that yes it does too fund SETI with Jill Tarter’s exploration of how SETI is/isn’t allowed in various NASA calls through the years here. 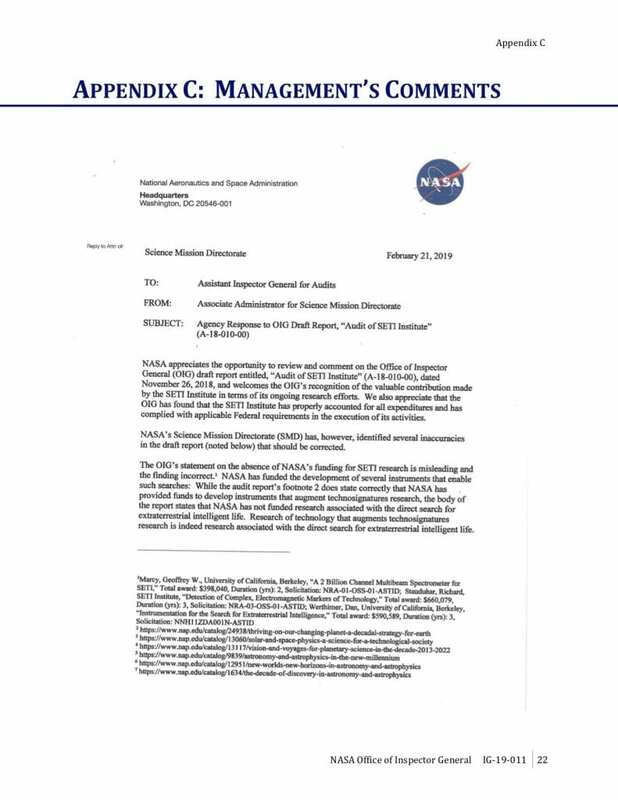 The bottom line is that what SETI needs is an explicit recommendation for funding in this upcoming Decadal process and/or explicit mention of technosignatures as an authorized expenditure for NASA and the NSF by Congress. Here’s hoping that the winds really are changes and that we’ll get both in the next couple of years! This entry was posted in science on March 13, 2019 by jtw13. With a budget as large as the U.S. has the amount mentioned above is ludicrous, especially considering the amount of pork in that document each year. Science has very little influence in Congress, especially considering the current administration. A sad reflection on the decline of American influence in practically every sphere of life.